Here at the Forge Garage we work on different makes and models of car. 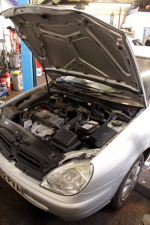 We have listed some of the cars we service and repair on the makes of car page. If you car is not there give us a call to check. Book your Car Service with us today, contact us on 0118 983 2822 or look on our 'Contact Us' page for other contact details. What's included in my Car Service? Forge Garage service and repair most makes of car and van.